In a recent post, Member Communications & Information Overload - Finding Balance, I noted that it is important to think about member communications in terms of relationship-building. And like any good relationship, you need to develop an understanding of your members in order to offer relevant, welcomed and engaging communications. I also noted that organizations might consider developing a content strategy to identify, capture, create and distribute relevant and valuable content to attract, retain and engage your membership. For membership organizations that want to better understand relationship building - or breakup, as well as the power of content; or if you simply want to hear what other nonprofit communicators have to say on these topics, we've identified the following report, white paper and guide that may offer some interesting food for thought for membership and non-profit organizations in your marketing efforts. The folks at Exact Target suggest that "if you think of a consumer's online interaction with your brand as a treasured relationship (and you should) the next logical step is to explore the termination of that relationship, or what [they have] dubbed, "The Social Break-up." This report - the 8th in their Subscribers, Fans & Followers research series - examines the reasons why people disengage with bra nds and offers insight into what drives engagement through email, Facebook and Twitter - as well as what actions can inadvertently drive consumers away after the social honeymoon is over. While it focuses on corporate brand marketing, it offers interesting insight for non-profits and other membership-based organizations that are marketing to and/or communicating with their audiences via email or social media. While this report focused on "how consumers want to interact with brands through Email, Facebook, and Twitter," its insight could also apply to your relationship with your members and their monthly subscription to your e-newsletter or membership bulletin. "The relationship begins with the initial "spark"-the decision by the consumer to become a SUBSCRIBER, FAN, or FOLLOWER....As the relationship progresses ...companies express their commitment to the relationship through engaging communications, delivered at appropriate intervals. But marketers must realize that the definitions of "engaging" and "appropriate" vary by channel. Communication practices that convey warmth and respect for the consumer through one channel can just as easily convey indifference-or desperation-through another. If the company fails any of these relationship tests, a "social break-up"-i.e., an "unsubscribe," "unfan," "unlike," or "unfollow"-is all but inevitable." 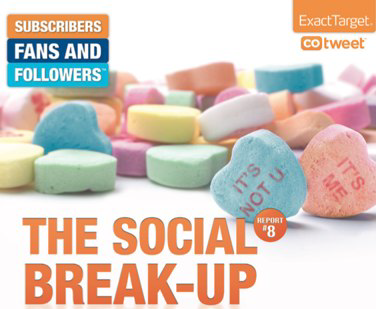 To download The Social Break-up, visit ExactTarget.com. We've all heard the truism "content is king," but this PRNewswire White Paper explains why "content is marketing" and why as the "Age of Engagement Dawns...content is the currency. ... Simply stated, the interaction between marketers who are increasing their investments in high-quality content and consumers, who are engaging with - and sometimes creating - content around brands ... is changing the nature of both content and marketing in ways that are profound." While this white paper focuses on content marketing from a corporate brand perspective, it offers insight that is applicable to non-profits, associations and other membership-based organizations. Climbing content use transforms marketing: "The big news emerging from interviews of leading marketers is the sheer number of transformations in the art and science of marketing that they attribute to the increasing use of - and audience interaction with - substantive content and targeted distribution." Media fragmentation: the mother of invention: "Fragmentation is both a blessing and a curse... It's great that we have all of these different channels to content with... The curse part of it is, someone has to manage all that content, someone has to figure out what it is and what goes where." Consistency spoken here: "If the Holy Grail of engagement is a "content-rich, two-way communication between brands and their customers ... it requires marketers to keep up their end of the conversation with a consistent stream of high-quality content." Distribution: everywhere your content wants to be: "Overcoming media fragmentation lies in creating content worth sharing, learning where your audience fragments are congregating in order to determine your distribution plan, and then exploiting technology to imbue your content with characteristics that enable it to "find the right audience." Content enables re-integration of audiences: "... content has the potential to become the "glue that binds" all marketing activities. The right content can create a consistency of messaging across multiple platforms." To download the Content is Marketing white paper, visit PRNewswire.com. To download The 2011 Guide to Nonprofit Marketing Wisdom, visit GettingAttention.org. Thanks Lori...a very enjoyable read.